Carl Mayer, the outstanding German script writer whose first triumph was The Cabinet of Dr. Caligari (1920), had planned The Last Laugh (Der Letzte M ann, 1924) to be the third part of a trilogy he had been working on with the director Lupu Pick. A disagreement between the two brought in F. W. Murnau as the director, a circumstance which proved to be historic. With the illustrious Karl Freund at the camera, Murnau fashioned one of the great cinematographic achievements of the silent era. The film, shot entirely without titles, was an extremely Germanic Existentialist tragedy, though not clearly an Expressionistic one. It recounts the social destruction of a doorman, who, upon losing his uniform, loses his being-in-the-world. Having grown too old to carry luggage, the doorman must exchange his braided coat for a simple white jacket and be the attendant in a men’s lavatory. 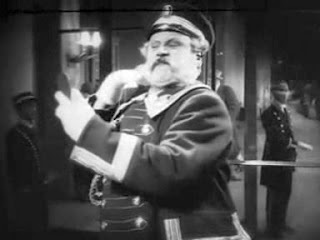 The resulting dishonor ruins the old man, played by Emil Jannings, (he also starred in The Blue Angel, 1930) as well as his entire family. The full tragic implications of a film like this can only be understood in a country where uniform is king. The film abounds in skilful use of symbols, which are so well integrated to the action that they need not be noticed to appreciate the film. In particular, the revolving door, whose movements the doorman is so proud of controlling, becomes a symbol for the swirl of life itself. The Last Laugh is a showcase of camera technique. Lupu Pick claimed to be the first to use the moving camera in 1922 and Wegener’s cinematographer, Boese, insisted he used it for The Golem (1920). But for Murnau, the camera moving on a dolly was no longer enough: he tied it to his cameraman’s chest and had him follow Jannings step by step with each camera angle chosen for perfect expressive and pictoral composition. Freund’s camera plays with beams of the nightwatchman’s torch, moving to and fro in a fashion characteristic of the German filmmaker’s fondness for light play on surfaces. Yet each shot is well motivated. The inclusion of Expressionist style in a film depicting psychological developments in a middle-class atmosphere seems impossible, but Murnau does it with the exquisite drunken dream sequence, wherein the daily torture of the doorman comes out in all its horror. The panels of the revolving door, now gigantic and Expressionistically distorted, collide with the sleeping man’s brain and split it in two: a precise image of the schizoid nature of all dreams. The concern for details slows the pace down and occasionally disconcerts modern audiences who are unaccustomed to viewing films in which the psychological development is conditioned by each meaningful but minute detail. 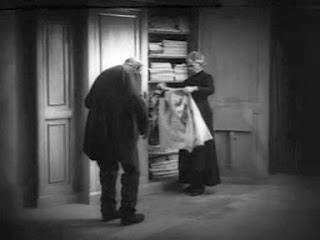 The freedom of the mobile camera and the title-free narrative enables Murnau to explore the characters in great depth. In fact Eisner (The Haunted Screen) asserts that the ponderous pace of the film is essential to this investigation into the Germanic world and gives it the ultimate meaning . Mayer and Murnau were forced by their producers to have a happy ending. They did so ingeniously, without sacrificing the film’s artistic merit, by taking on a facetious ending, an epilogue, essentially, which is even more biting in its commentary than the original ending and is, indeed, the last laugh. Lotte Eisner, The Haunted Screen: Expressionism in the German Cinema and the Influence of Max Reinhardt (1974), University of California Press.